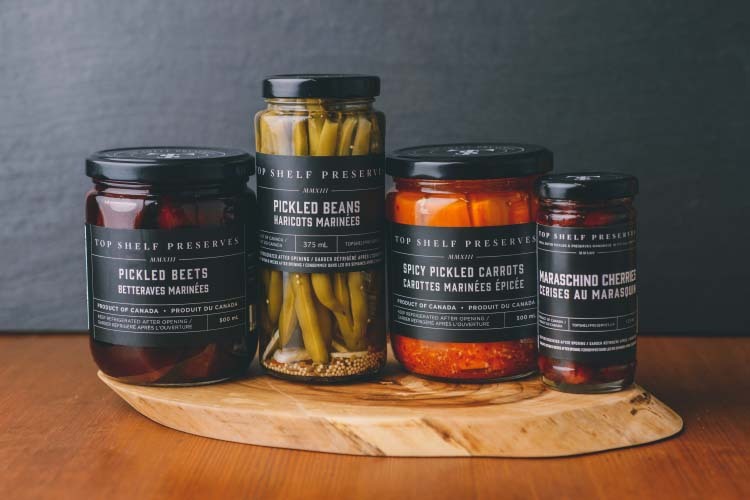 Top Shelf Preserves is a growing small business crafting small batch handmade pickles and preserves in Old Ottawa South. Sara Pishva started the business in May 2013. She has worked hard to establish Top Shelf Preserves as the go-to purveyor of gourmet pickles and preserves in her hometown. Sara grew up making and enjoying preserves with her family. Growing up on homegrown plums in syrup, sauerkraut, torshi (Persian pickled vegetables) and other old fashioned preserves, Sara has a taste for the tangy and vibrant flavours and wonderful textures of fruit and vegetable preserves of all kinds. Fan favourites include Rhubarb Raisin Chutney (the ultimate cheese condiment), Spicy Pickled Carrots (with Korean chili flakes and organic garlic), Classic Pickled Beets (a fifth generation family recipe), and Blueberry Gin Jam (wild blueberries combined with Dillon’s gin and lime juice). In addition to a regular lineup of pickles and preserves, Chef-Owner Sara Pishva crafts a limited edition seasonal small batch every month.